In the year 2009, America has found itself in big trouble. With out-of-control government spending at its peak, the country and its taxpayers are desperately searching for a willing Patriot who understands what fiscal responsibility means. Though we must remain focused on 2009 and finding solutions this year, Newt Gingrich made the comment, "Remember, everything Obama's doing, Bush started last year. If you're going to talk about big spending, the mistakes of the Bush administration last year are fully as bad as the mistakes of Obama's first two, three months." To clarify, Gingrich further explained what it means to be fiscally responsible. He said, "During the period I was speaker, the U.S. government – for four years – total growth was 2.9 percent a year. Under Bush, it was 6.1 percent. ... This year, I think it will be 36 percent in one year. It is just literally irrational." Indeed it is, I'm with Newt Gingrich 100%. * Broad scale engagement of elected officials and candidates of both parties at all levels of government, interested citizens, private sector leaders, reporters, scholars and students. * Development of big, breakthrough solutions to the most important issues facing this country, including creating jobs and prosperity, energy independence, protecting workers' rights, reforming education, moving government into the 21st Century and more. * A process to educate, ignite collaboration and implement these solutions across all levels of government with widespread support from citizens. Going back to fiscal responsibility for a moment, in an interview from On the Record with Greta Van Susteren, Gingrich said, "I am very sad that a number of Republicans do not understand that this country is sick of earmarks. They are sick of politicians taking care of themselves. They are sick of their money being spent in a way that is absolutely indefensible ... I think you're going to see a steady increase in the number of incumbents who have opponents because the American taxpayers are increasingly fed up." Newt noted how, at American solutions, the organization is "working to help people with the April 15 taxpayers parties," because it was good for those Americans who are fed up to communicate how ready they are to fire some of their incumbents next year. The organization joined a growing Republican Revolution following the February 27 "Chicago Tea Party" protests, helping to guide future rallies where hundreds of thousands of taxpayers showed public outrage against massive bailouts for businesses thought to be too big to fail. When Greta asked if he is thinking of running for President in 2012, Newt replied, "I want to spend all of 2009 trying to develop good policies at American Solutions ... trying to defeat bad policies, like the effort to take away your right to a secret ballot before being forced to join a union. We need to focus everybody on 2009 and finding solutions this year because we are on the edge of being in big trouble." Most recently, Newt Gingrich was welcomed to The Daily Show for an interview with Jon Stewart. Gingrich made an appearance on Comedy Central to talk about his book, 5 Principles for a Successful Life, and he also discussed current political issues that have affected the Republican Party. Newt has proven that he knows what it means to be accountable in politics, holding himself and the government to a higher standard, upholding fiscal responsibility with taxpayer dollars; and at the same time, he can be funny but serious too! I thoroughly enjoyed his interview on The Daily Show. In fact, it's one of the first times I've seen liberal Jon Stewart have a, "Wait, what?!" moment when discussing political issues with a Republican. If Gingrich can show Stewart the light, there's a possibility he can show others what it means to be accountable in politics too. I expect to see more and more of him in the coming years, hopefully playing a much larger role in politics once again, showing what it means to not just talk-the-talk, but walk-the-talk. For everything Newt Gingrich does to appropriately and successfully represent the American people, he has proven that he loves America -- for that, he's a true patriot! The theme for this particular post is to "do a good turn daily." This is also the slogan for the Boy Scouts of America. Some example of Good Turns are "saving a life, helping out after floods or other disasters, recycling community trash, and working with your patrol on conservation projects." A Good Turn is a special act of kindness; a volunteered kind act of good deed. Another example of said kindness can be construed as helping the environment. Having been honored with the 2007 SOLV Citizenship Award, a volunteer in the video can be heard explaining, "Bosky Dell is probably the heart of the native plant nursery community [...] like a native plant wonderland, really." Lory Duralia, Bosky Dell property owner, feels her mission or goal is to assist people with preserving Earth. "We need to take care of Earth so the Earth will take care of us." Lory continues, "We want Earth to be a good place for our children to live, and for our children's children as well." For instance, Bosky Dell provided all the plants that are planted on the "Eco-Roof" at the Native American Student Community Center at Portland State University. To name just a few species Bosky Dell Natives provides a habitat for, there are rabbits, weasels, birds, coyotes, and many more that depend on a well-preserved, clean environment. Lory Duralia started Bosky Dell Natives nursery eighteen years ago. With an ever-growing passion for the environment, she purchased the land across the drive from the nursery that borders beautiful Fields Creek. Working on various environmental projects such as Fields Creek Riparian Restoration – a Tualatin River basin restoration project, Lory and other volunteer crews worked to improve stream health for cutthroat trout, red legged frogs and other native species. With a grant from OWEB and the help of SOLV and so many other volunteers, Lory Duralia restored the stream. Due to the restoration project, the creek can now resume its role as essential habitat for Red Legged Frogs (a threatened species), salamanders, Golden Mantle Squirrels, native Cutthroat Trout, Douglas Squirrels, deer, and a wide variety of birds, butterflies and dragonflies. In addition, the water that enters the stream will be filtered naturally by the stream side plantings. Lory Duralia (pictured: left) provided the vision for the Fields Creek restoration. She put together the restoration design, invited neighbors, friends and customers of Bosky-Dell Natives to dig in the native plants, and organized the barbecue while inviting Judy Bluehorse-Skelton to talk about native plants for healing. Recently, however, Bosky Dell Natives has been struggling with a neighbor whose actions can only be described as inconsiderate and anti-environmental. Lacking the understanding or care of work by others, ladies and gentlemen, meet Dr. Michael Robinson! Described as a man of coarse, vulgar language, Bosky Dell Natives has had its fair share of run-ins with Doctor Robinson. He cares little about the environment or volunteers who support nature, and more about destroying their hard work for his own personal gain - regardless of the destruction his actions cause. For example, here's a recent project he opted to pursue, installing a mailbox on public property surrounded by protected environmental native plants. To make room for his spiffy mailbox, which is rumored to be placed illegally (without permission from the post-office), the Bosky Dell Natives neighbor insisted on destroying a protected environmental area previously developed by Lory and the many volunteers, including children (as seen in the first video). After throwing thousands of dollars in plant costs in the trash, Dr. Robinson took it upon himself to extend a public road several feet, in turn forcing the letter-carrier to drive through protected Wildlife and natives simply to deliver mail to his mailbox. Rumor has it the letter-carrier is refusing to deliver to it. Unfortunately however, the remarkable habitat didn't get a say whether or not it could live. While paving his own personal road on public property, you can see the freshly cleared road over the protected environment, and you can see his shiny new mailbox. What's that behind his new mailbox? The sign??? Oh there it is, a now hidden Backyard Wildlife Habitat sign that reads, "This property provides the four basic habitat elements needed for wildlife to thrive: food, water, cover, and places to raise young. 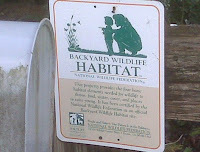 It has been certified by the National Wildlife Federation as an Official Backyard Wildlife Habitat site. 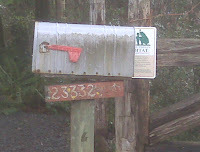 Tell me, doctor, can your mailbox match or replace any of the four basic habitat elements needed for wildlife to thrive? Will a threatened species, the Red Legged Frog, be provided the shelter or food your mailbox replaced? * they cannot be easily or fully replaced once they are lost. * they provide homes for diverse species, the values of which (e.g., medicines) we are only beginning to understand. * they help prevent flooding by catching rain and slowly releasing it back to surface and groundwater. * the plants emit oxygen and filter air and water pollutants. * they often have recreational and educational value. Other helpful tips include reducing lawns and changing maintenance practices, avoiding and removing invasive plants, using natural design and conserving natural resources. Besides the obvious frustration this has caused for Lory Duralia and Bosky Dell Natives, the protected environment she preserves wasn't grown and maintained for the ultimate recreation and destruction by one man: Michael Robinson. With nowhere else to go for help, after talking with Lory I've decided to do my part and make it be known that situations like this shouldn't be ignored by the Oregon environmentalists (or anyone for that matter), nor should the inconsiderate neighbor to Bosky Dell continue this destruction. What can you do to help? As Lory would say, "Help take care of Earth so the Earth can continue to take care of us." Tell Dr. Michael Robinson his actions cannot continue without outcry from concerned citizens. 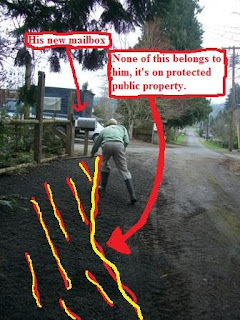 The public is likely to uphold environment over the development of a personal road on protected public property. The problems don't end with the mailbox. The list goes on. And the neighbor to this Wildlife habitat has made it clear he won't stop. Maybe with a little motivation he will wake up and realize that sometimes, doing a Good Turn Daily requires selfless acts of humility. How are the Tea Parties creating 'Insanitea'? On coverage of the events, did MSNBC and CNN miss the mark on tea party protests? Why won't the mainstream media just tell the truth? Here's Glenn Beck on, "The truth about the tea parties." Then again, maybe it is those conservative racists. Sigh. The strategy: for Democrats to gain as much power as politically possible. The tactic: wave the right-hand to distract, claim how far-right it’s moving; simultaneously, shift the hidden left-hand as far-left as possible. Obama’s power-sponge grows, soaking up even more than imagined—power. Celebrating his 100th day in office, US President Barack Obama secured unfettered power in Washington, gaining a Congressional “super-majority” not seen since 1977. Last possessed by Democrats in 1977 under President Jimmy Carter; it took over a generation for another filibuster-proof majority to resurface, making it easier for rapid progress with key items on the Democrat’s bulging legislative agenda such as healthcare reform. In a note to Arlen Specter after his move, Mr. Obama stated that Democrats are “thrilled to have [Senator Arlen Specter],” who feels Republicans had “moved far to the right” in recent years. So as to balance the far-right, Mr. Specter’s shift in political affiliation allows for a Liberal Supermajority to reign. It seems to me we're moving much further left than some Congressional leaders are willing to admit. The Liberal strategy must be working. Prior to the 2008 US Elections results, I asked that the ‘real Obama please stand up’ and show his true agenda; since then, he’s more than answered the call. Obama has better defined his motives for “change,” and the over-stayed Nancy Pelosi is clearly enthralled with all of it. Now with a super-majority, democrats can slam through their agenda with greater ease. And they will continue to do so. The massive increases in debt created from, as Pelosi described it, a “wave upon a wave” of earmark-riddled, ‘pork’ barrel spending bills will ensue. The 60 votes needed to overcome tactics known as filibusters have succeeded; nothing remains from stopping the increases in wasteful spending. Whether planned or unplanned, the first 100 days of his presidency have shown that Obama possesses an extreme left backbone to support his political agenda. The Obama administration might lack the integrity or honor that his predecessor’s have offered before him, but the power and influence he holds has only grown since January 21. The Road to Socialism and Communism is... the Revolution of change. Beginning with down-payments to socialized health care and government ownership of businesses, a Congressional super-majority now gives the extreme left-wing movement its desired momentum. Unfortunately for capitalist pigs and right-wing extremists, Obama looks to strengthen his tidal wave of unwanted, wasteful spending and shove his undesired agenda down Americans throat over the next two years. Oh joy.